Point Reyes National Seashore contains unique elements of biological and historical interest in a spectacularly scenic panorama of thunderous ocean breakers, open grasslands, bushy hillsides and forested ridges. Native land mammals number about 37 species and marine mammals augment this total by another dozen species. The biological diversity stems from a favorable location in the middle of California and the natural occurrence of many distinct habitats. Nearly 20% of the State's flowering plant species are represented on the peninsula and over 45% of the bird species in North America have been sighted. The Point Reyes National Seashore was established by President John F. Kennedy on September 13, 1962. Situated on the eastern edge of Point Reyes Peninsula, the blue waters and sheltered coves of Tomales Bay State Park are a popular destination for a day of picnicking, hiking or water-oriented activities. The Coast Miwok people were the first to inhabit this coastal area of sheltered coves, beaches, tidal marshes, and forest of Bishop pines. In the 1940s real estate developers began to purchase large areas of beachfront land, prompting local residents and conservation groups to save this area as a park. 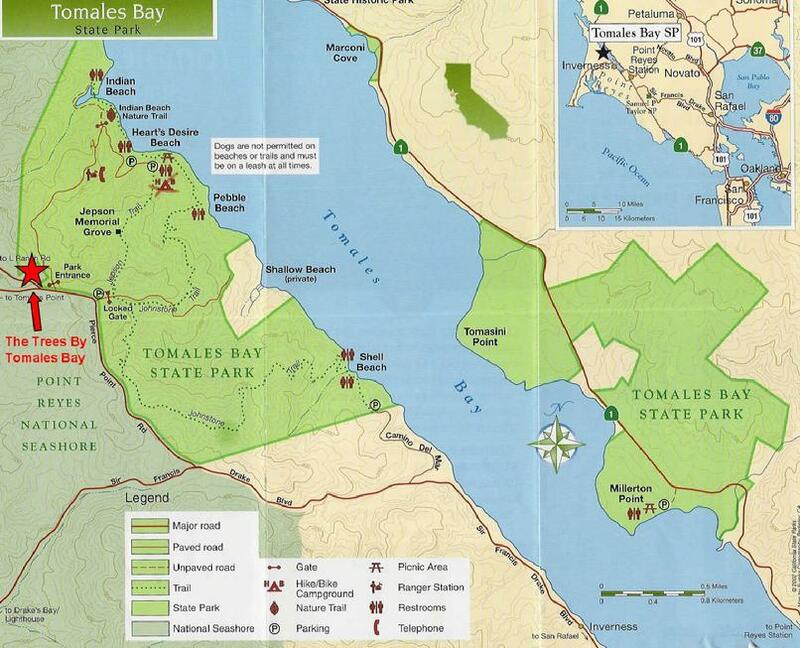 In 1952, Tomales Bay State Park was formally dedicated and opened to the public. The beaches and east-facing slopes of this 2,000-acre park are especially attractive because they are protected from the prevailing winds by the high backbone of the Point Reyes Peninsula. The park is located 40 miles north of the Golden Gate Bridge, close to Inverness and Point Reyes Station and the Point Reyes National Seashore. 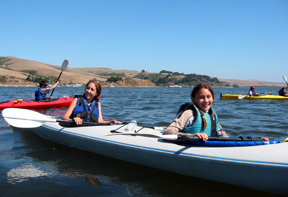 Blue Waters Kayaking offers rentals, classes, tours, specialty, full moon, twilight and oyster trips on Tomales Bay. 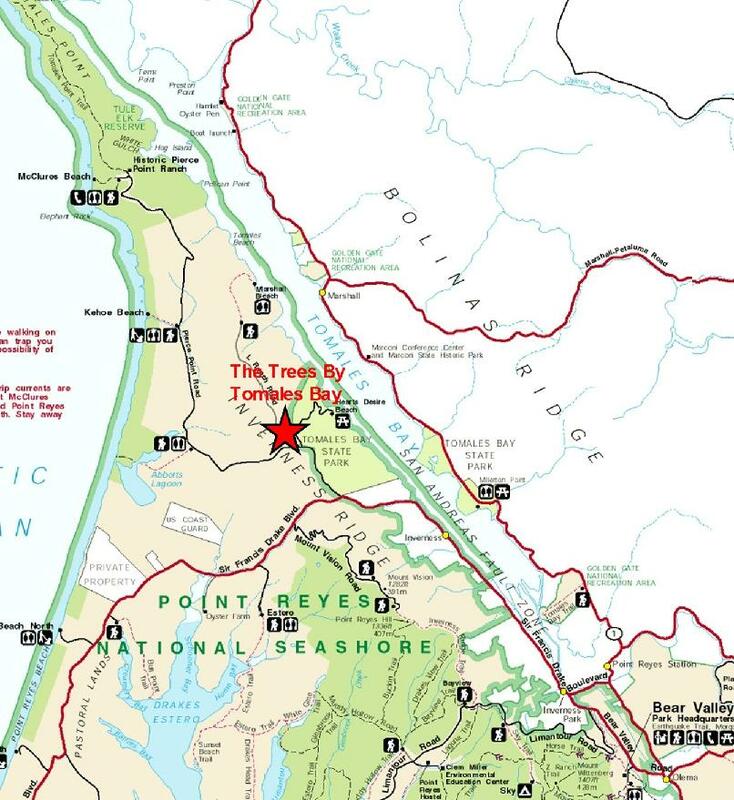 Located in Inverness next to the Golden Hinde Inn & Marina (7 minutes away) and also in Marshall (25 minutes away), Blue Waters Kayaking provides the opportunity to enjoy the uniqueness of Tomales Bay and the Point Reyes National Seashore from another perspective, also allowing access to natural areas not easily accessable by foot. A visitor's online guide to recreational, dining & shopping for the Point Reyes National Seashore, Tomales Bay, and surrounding villages of Inverness, Marshall, Muir Beach, Olema, Point Reyes, Stinson Beach and Tomales. Five Brooks Stables is a full service stable for the whole family. There are activities for all ages who wish to enjoy the magnificent Point Reyes National Seashore in the company of their equine pals. Five Brooks special in providing guided trail rides for park visitors who desire an alternative method to enjoy the scenic splendor of the park. With over 120 miles of trails that take you from forested mountain tops, grassy meadows, coastal scrub and miles of white sand beaches, the Point Reyes National Seashore is the perfect environment to enjoy horseback riding. Take I-80 West. Continue until you pass Vacaville, then Fairfield, Cordelia, and the over the hills, down and up a big dip and then take Hwy 37 (exits right) towards San Rafael. (You will see Marine World with its roller coasters as you descend into Vallejo). The exit is just past the rest stop. At the stop sign, turn left on to Atherton Ave. This is a short cut that takes you to San Marin Drive. After a few turns, the road is straight, passes a fire station, and eventually swings left. Shortly again, you will reach several lights as you cross over Hwy 101. Continue thru the lights and Atherton Ave. becomes San Marin Drive. Continue on San Marin Drive for @2.9 miles. You will go through 6 stop signs. At the 6th, you will be at Novato Blvd. & San Marin High School will be on your right. Turn right (always follow signage to Point Reyes). Continue for 6.3 miles (you will pass Stafford Lake and park shortly and then finally reach a stop sign. (You must turn left or right.) Turn left towards Point Reyes. Continue for 6.9 miles. Shortly you will see a fire station and then the Cheese Factory on your right. (The Cheese Factory has wonderful cheeses and also restrooms). After going over a small pass you will reach lake Nicasio, and then come to a stop sign at a small concrete bridge...currently purple. Turn Right to Point Reyes, which is 3.1 miles. At the stop sign, you are at Hwy 1. Turn Left and you will go down a hill and into Point Reyes...follow the yellow line and Hwy 1 signs which will take you left thru downtown and the right at the end of town. You will then see signs indicating Lighthouse, Beaches and Inverness. You will cross a green steel bridge and then turn right to Inverness and Beaches. This is Sir Francis Drake Blvd. and it ends at the Lighthouse. Continue on Sir Francis Drake Blvd for @ 6.4 miles. The road stays near the bay, goes thru Inverness Park, then Inverness, and eventually swings left and heads up a steep grade. At the top of the grade you will see a Point Reyes National Seashore sign on the left and the road continues on the right side of a small meadow. On the right in a short distance you will see a sign indicating a "Y" ahead. The brown park signs on the right will indicate "Lighthouse" to the left, “Tomales Bay State Park and McClures Beach” to the right. You will go right and continue for about 1 mile. This heads up a short grade and continues along the ridge for a short distance, then makes a sweeping left turn downhill. Tomales Bay State Park "Hearts Desire Beach" entrance is at the bottom of the hill to the right. Slow as you pass the park entrance. Roughly 50 yards past the park entrance a small paved road goes off and up to the right. You will see 3 mailboxes on the right where the road splits off, this is the beginning of our property. This road is called Duck Cove/Marshall Beach Road and there is a large white Dairy sign with the road signs. Another 40 yards up this road on the right you will see a driveway with a big wooden gate wit the address 1214. This is our entrance. Exit Sir Francis Drake Blvd. and head west. This will take you thru San Rafael, Ross, San Anselmo, Fairfax and then head up and over a grade into San Geronimo Valley, Lauganitas, etc. In a short while Sir Francis Drake Blvd. enters Samuel P. Taylor State Park, and ultimately head up another steep grade and down the other side into Olema. You will come to a stop sign at Hwy 1. and must turn left or right. The Olema Inn is on your right. Turn right. About 1 block further there is a small road to the left. It is Bear Valley Rd. and is signed for Park Headquarters, Beaches, Lighthouse, etc. Turn Left. This will take you past the Bear Valley Park Headquarters of the National Seashore and will eventually come to a stop sign at a corner. This is again Sir Francis Drake Blvd. You will go straight (slight left) to Inverness and Beaches. Right is to Point Reyes. Continue on Sir Francis Drake Blvd for @ 5+ miles. The road stays near the bay, goes thru Inverness Park, then Inverness, and eventually swings left and heads up a steep grade. At the top of the grade you will see a Point Reyes National Seashore sign on the left and the road continues on the right side of a small meadow. On the right in a short distance you will see a sign indicating a "Y" ahead. The brown park signs on the right will indicate "Lighthouse" to the left, “McClures Beach and Tomales Bay State Park” to the right. You will go right and continue for about 1 mile. This heads up a short grade and continues along the ridge for a short distance, then makes a sweeping left turn downhill. Tomales Bay State Park "Hearts Desire Beach" entrance is at the bottom of the hill to the right. Slow as you pass the park entrance. Roughly 50 yards past the park entrance a small paved road goes off and up to the right. You will see 3 mailboxes on the right where the road splits off; this is the beginning of our property. This road is called Duck Cove/Marshall Beach Road and there is a large white Dairy sign with the road signs. Another 40 yards up this road on the right you will see a driveway with a big wooden gate with the address 1214. This is our entrance. From 101 exit on Washington St. and go west (right). Go about 5 blocks and then turn left AT Lakeville Rd. At the next block, D Street, turn right. Follow D Street out of town. Continue for about 9 miles where you will see a fire station and then the Cheese Factory on your right. (The Cheese Factory has wonderful cheeses and also restrooms). After going over a small pass you will reach lake Nicasio, and then come to a stop sign at a small concrete bridge...currently purple. Turn Right to Point Reyes, which is 3.1 miles. Continue on Sir Francis Drake Blvd for @ 6.4 miles. The road stays near the bay, goes thru Inverness Park, then Inverness, and eventually swings left and heads up a steep grade. At the top of the grade you will see a Point Reyes National Seashore sign on the left and the road continues on the right side of a small meadow. On the right in a short distance you will see a sign indicating a "Y" ahead. The brown park signs on the right will indicate “ Tomales Bay State Park and McClures Beach” to the right , "Lighthouse" to the left. You will go right and continue for about 1 mile.